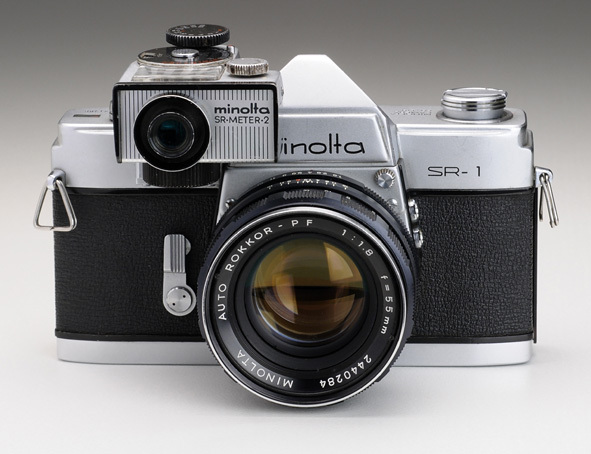 Minolta's first SLR was actually called SR-2. Their second the SR-1, and to confuse things further, their fourth SR-7. However, they were humble beginners in this business. Microsoft vastly improved on this idea and came up with a much harder-to-follow mix of version numbers, years, geographic names, mnemonics, and fantasy words when marketing successive versions of their products. But back to the SR-1... The things I like about this camera are; simple, easy to operate, and appears to be indestructible. I think the most appealing is the fact that it has nothing I don't need and almost everything I do need when I practice 'back to basics' photography. 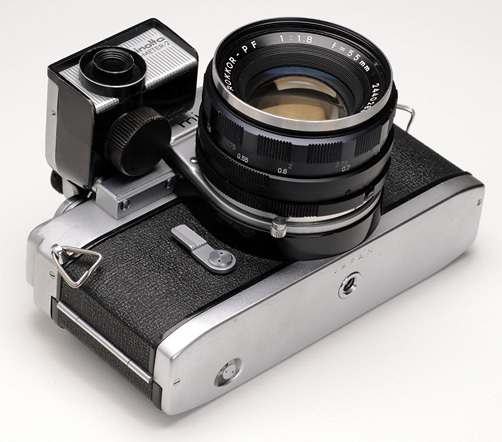 The reason I said almost is, because I'm missing the mirror lock-up possibility which can be found on later models, and a signal that tells me whether the film has been advanced or not as in the Praktica or Pentax Sensorex. On the other hand, I adore the simple little lever on the lens, which allows me to stop down the aperture. I prefer this to the later implementation - the push-in rod on the camera body (see SRT 101, for instance). Lastly, I find the large central microprism circle very easy to focus with - more so than the split image type, which came into fashion in later years. The camera I have here is only one of several variants made between 1959 and 1971. It has a round viewfinder window and a top shutter speed of only 1/500 sec. The attached CdS light meter must be of a later manufacture, as it has a setting for 1/1000 sec. It used the now extinct 1.3 volt mercury battery (e.g. Varta V 625 PX). 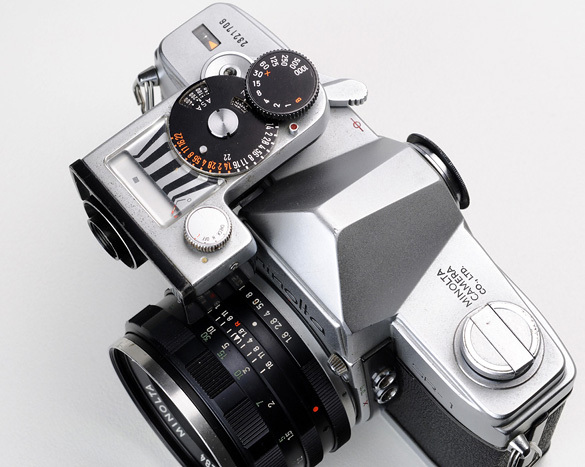 There is a physical coupling between the shutter speed dial on the light meter and the shutter speed dial of the camera, but otherwise they operate entirely independently. The bottom of camera is very simple. There is no battery compartment, of course, and the tripod socket is positioned where it should be; in the middle. The only little button visible there is for disengaging the film transport sprockets when rewinding the film. 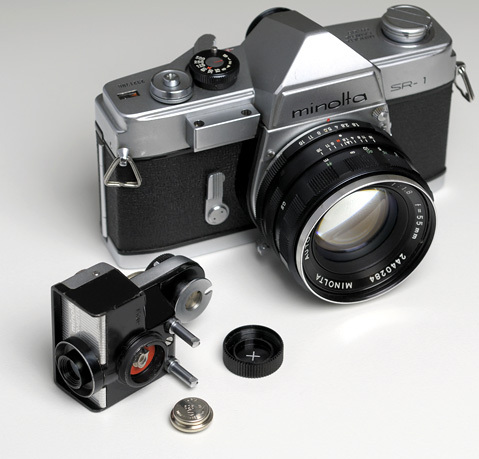 To mount a lens, one needs to line up the red dot on the lens with the red dot on the camera housing (just below the Miolta logo) and turn the lens clockwise (when facing the camera) until it clicks. To dismount, one first presses the milled button at the 1 o'clock position below the letter a downwards, then turns the lens in the opposite direction. Easy enough, but the position of the lens lock button makes it somewhat awkward, as it is uncomfortably close to the lens barrel. Somehow it never occured to me to use flash with vintage cameras, but just for the record, the SR-1 has a socket for bulb (marked FP) and electronic flash (marked X) synchronisation. The max. shutter speed for electronic flash is 1/50 sec. This is indicated by an X symbol between the figures 30 and 60 on the shutter speed dial. 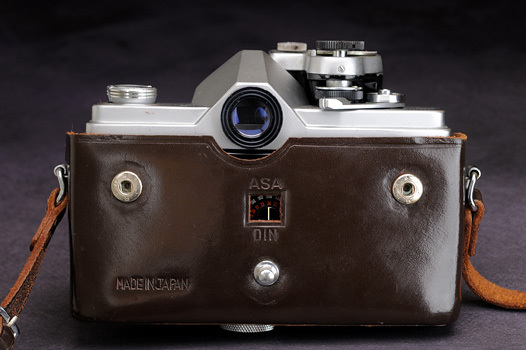 A separate accessory shoe was available to mount the flash over the top of the pentaprism housing. The shutter curtain is fabric. The film guides are very simple. 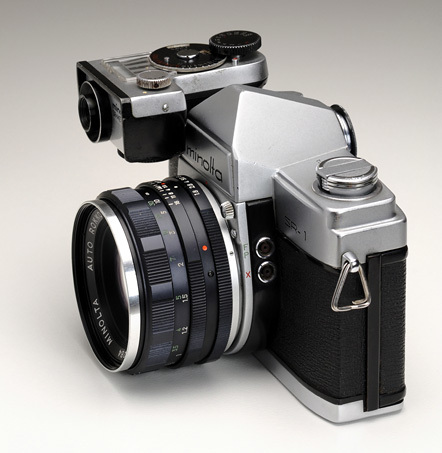 A far cry from the elaborate mechanism we see on Canon QL cameras (although those came out a few years later). 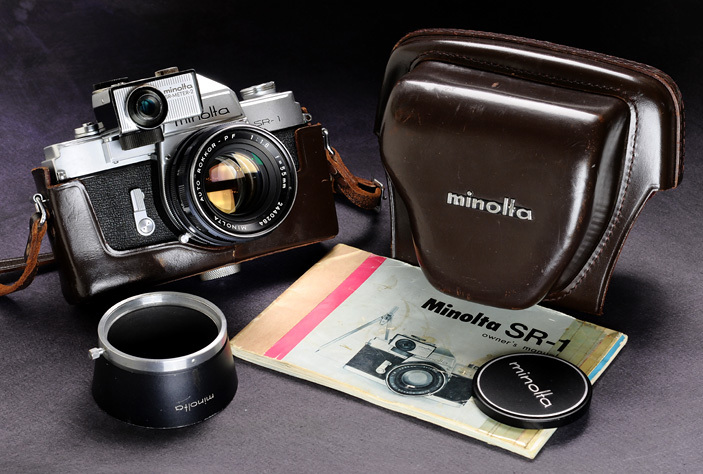 A massive big brown leather carry case was available for the camera-light meter combo. The lens cap and hood were made of metal.